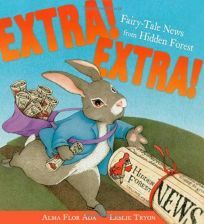 Abandoning the epistolary style of their first three books about the denizens of the Hidden Forest (Dear Peter Rabbit), Ada and Tryon use a newspaper format to tell several stories at once. Tryon alternates black-and-white newspaper pages with watercolors of fairy tale characters to good effect, but the chopped-up tales and scattered extraneous material seem too complex in both narration and vocabulary for the book's target audience. In addition to a tale about Pinocchio and Geppetto, the story of Jack and the Beanstalk appears on news, op-ed and interview pages. Although the paper features some international news, it largely maintains a folksy small-town tone that often feels didactic. The sports pages cover the race between the Hare and the Tortoise, while the Mexican folktale about the Half-chicken makes international news. Some of the funniest bits appear on the newspaper's ""Back Page"": Mr. Fer O'Cious and Mr. Wolfy Lupus, villains from previous books, offer such enticements as Cooking Lessons where ""You provide the ingredients."" Ages 5-8.